Good morning yall. I've been wanting to publish this recipe for quite some time, but it seems life and work have really gotten in the way. If you've never had pasta fagioli and you call yourself a connoisseur of Italian cuisine you are a total fraud! 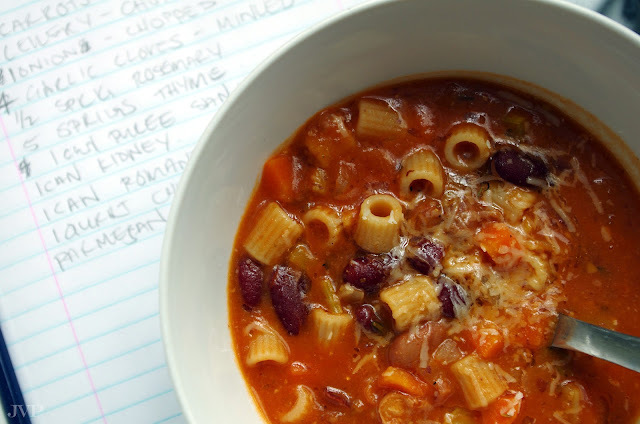 This soup epitomizes Italian comfort food. It's a delicious dish with modest ingredients and humble beginnings. Pasta fazool as it's called in the U.S. is one of my all time favorite soups and literally means pasta and beans. While I was writing this recipe I was blogging about the process. I promised Tess from Slow Cooking Kitchen I would let her know as soon as it was ready. This is for you Tess! PREP: Chop all veg. Puree the tomatoes - just place immersion blender into the can and slowly pulse until smooth. For beans puree 1/2 before adding to the soup (this creates a beautiful creamy texture). COOK: In a large soup pot add butter and evoo and begin to sautee onion & garlic. After 5 mins add the fresh and dried herbs + a pinch of s&p. After another minute or so add the carrots and celery. Cook down for another 5 mins before adding tomato puree, water, stock & parmesan rind. Bring mixture to the boil (about 8-10 mins). Then add your pasta and cook covered for 5 mins. Oncover and add all of the beans (pureed and whole). Cook on a low simmer for another 10 mins or so. Add parmesan and enjoy. 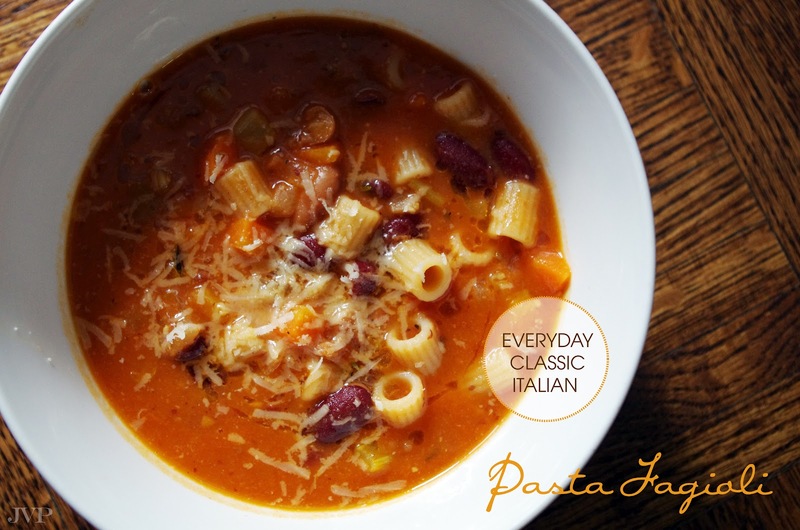 I love a good bowl of pasta e fagioli - it is indeed comforting! And so good for you! Although I'm not Italian, I love the cuisine. I'll have to replicate this. Also, congratulations on making the foodbuzz Top 9! Thanks so much. Please do try the recipe, it's really simple and delicious! Let me know how you like it. I am not normally the biggest fan of tomato-based soups, but this looks incredible and so comforting. I think I may have to give it a try! Buzzzz!! Great post and lovely photo. You deserve a buzz today. Good Luck with this one!! Mmmm, looks so good. I'm a big soup fan, this is going on the to-do list! This is seriously drool inducing. What a wonderful recipe. I adore fagioli. I'm going to have to make this soon. What a fantastic soup! I'm a big fan of soups, so I can't wait to try this out when the weather is a bit cooler.